The Wagan 30 Watt solar power e-charger does not require direct sunlight to provide a trickle charge; daylight alone is sufficient. It will work even when the skies are overcast or cloudy. The monocrystalline panel can be used to charge any 12V battery and is ideal for vehicles and boats that are stored for extended periods of time. The units can also be used to keep the batteries charged on RVs or even tractors that are seldom used. The unit is a bit pricier than many units with similar power. The Wagan 20 Watt solar power e-charger converts daylight (no direct sunlight needed) into usable electricity for charging 12V batteries. By preventing drain, battery life is often extended. The monocrystalline solar panel functions even on overcast days. It is ideal for trickle charging power packs and batteries or to keep the batteries charged in RVs, boats, and trucks that are infrequently used. They can also be used to keep lawn care equipment, personal watercraft, and ATVs fully charged. 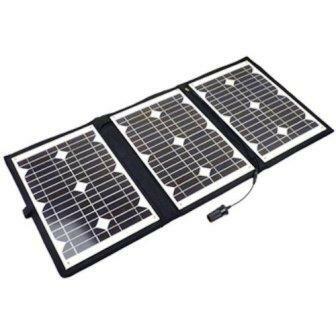 The Wagan EL2447 8 Watt solar e-panel is ideal for backpackers or others who need a charger that is small in size and can easily fit inside a glove box. When unfolded, the unit provides practically universal connection capabilities. Like most Wagan solar products, it requires daylight to charge but direct sunlight is not needed and it will even charge when skies are overcast or rainy. It is perfect for recharging cell phones, GPS units, and other portable devices yet is powerful enough to help the batteries of vehicles, boats, and RVs maintain their charges when they are in storage. This particular model is one of the more economical Wagan models and prices compare favorably with similar competing models. The Wagan EL2448 12.4 Watt solar e-panel charger for 12V batteries folds for easy storage and transport and is designed for both indoor and outdoor use. The tempered glass is made to resist impact from hail, airborne debris, and high wind. It can be used for charging cell phones, laptops, and other portable communications equipment. The unit can also be used to maintain the battery charge in RVs or vehicles that are stored for long periods of time. The monocrystalline panel works even when the skies are gray and needs only daylight rather than direct sunlight to function. Reviews of Wagan products are mixed. Several buyers reported that the units they received appeared to be in used condition, with scratches or fingerprints on the panel and missing instructions. As far as functionality, most buyers appeared to be quite satisfied with the output of the units and the quality of the construction.